If you’re driving a large vehicle and road signs prohibit you from passing, there might be a good reason for it. 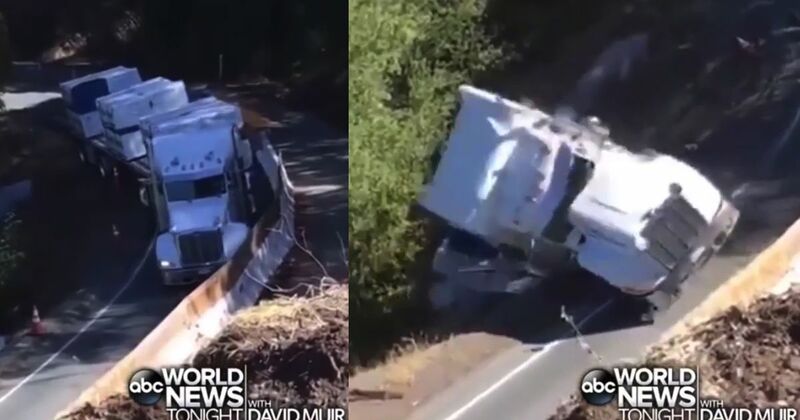 We join the big-rig action as filmed from the hillside above a tight Californian mountain turn, where a trucker has ignored signs telling him to turn back. The result is calamitous. The truck physically can’t make the turn; it’s too long. The trailer starts to fall off the barrier-less road edge and, naturally, takes the tractor unit with it. It looks like a violent fall, especially if you’re in the cab, but thankfully the driver was unharmed. State police took a dim view of his decision to try to make the turn in the first place, and have reportedly cited him for breaking the law. It might have been an awkward one to explain to his boss, too.